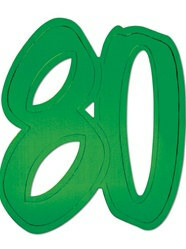 Let everyone know it is your 80th birthday because today is a day to celebrate! Have a birthday party like no other this year because your life deserves to be celebrated. Start off by decorating with these brightly colored "80" Foil Silhouettes. These silhouettes come in blue, green, yellow, orange, purple and red so no matter your color scheme you are in good hands. Pair these "80" foil Silhouettes with the Glittered "80" Sign and the "80" Whirls and your birthday decorations are almost complete! Who cares if you are over the hill? You now get to relax and coast down the hill while everyone else is still climbing their way up. Nice large foil numbers. Arrived very quickly. Just what I thought they would be. Description was accurate. Going to brighten the party room! Everything we got is perfect! cant wait to use it out our party!